John William Mauchly was born on 30 August, 1907, in Cincinnati, Ohio, in the family of Sebastian J. and Rachel Scheidemantel Mauchly. The father, Sebastian Mauchly, whose grandparents had emigrated to Ohio from Zürich, Switzerland, in 1839, was a high-school science teacher, who went on to receive his PhD in physics from the University of Cincinnati. When John was 8, his father received an appointment as a chief physicist at the Carnegie Institute of Washington, D.C., in the newly established Department of Terrestrial Magnetism. This position, and his apparatus, enabled John’s father to discover the diurnal variation in the Earth’s magnetic field, a discovery for which he secured a considerable reputation. Yet, if a commitment to science was one of the early elements of John’s socialization, he was also moved by the heady materialism of the 1920s. Although scientists in the United States were not yet a class unto their own, membership in an elite institution such as the Carnegie Institution enabled the Mauchlys to enjoy middle-class lifestyle, they carved out for themselves in a modest four-bedroom, one-bath frame house in the comfortable suburb of Chevy Chase, Maryland. John’s mother, Rachel Mauchly, was a strong woman, who enjoyed the gay lifestyle of the 1920s. She had attended the regular meetings of the local Women’s Club, hosted some of its luncheons, and held informal hen parties with her new friends and social acquaintances. The mother worked hard to cultivate her son’s interests. She arranged for the obligatory piano lessons, chided him for his penmanship, and saved up for the annual family vacation out at the Jersey shore. His father's occupation afforded Mauchly a decent education, beginning with his schooling at the McKinley Technical High School in downtown Washington. Yet in the grade school, Mauchly demonstrated his talent in construction and earned money installing electric bells in place of mechanical bells. When neighbors had trouble with their wiring, they called John Mauchly. He earned near-perfect scores in high school, was a whiz at math and physics, and was editor of the school paper his senior year (1925). Still, in balancing his school work with tennis matches and walks through the woods, or one of Edgar Allen Poe's ghost stories read in the dark among friends, Mauchly led a reasonably comfortable existence of an upper middle-class youth. His academic achievements brought him the Engineering Scholarship of the State of Maryland, which enabled him to enroll at Johns Hopkins University in the fall of 1925, as an undergraduate in the Electrical Engineering program. There were problems in his family, however. During one of his scientific voyages (sometime before 1925), Sebastian Mauchly had contracted a chronic illness. Unwilling to let go of his scientific work, he continued to work excessive hours, which only made his condition worse. Between 1925 and 1928, Mauchly received postcards from the New Jersey shore, where his family went to help father's convalescence. During his freshman year in Johns Hopkins University, Mauchly complained to his father about the General Engineering course, which attempted to provide a more theoretical foundation for engineering. By the end of his second year Mauchly began to feel that engineering was too mundane. In 1927 he made use of a special provision that allowed outstanding students to enroll directly in a Ph.D. program before completing their undergraduate degrees and transferred to the graduate physics program of the university. Mauchly's father passed away on Christmas Eve of 1928. A series of scholarships permitted Mauchly to continue with his studies after his father's death. Mauchly submitted his dissertation on "The Third Positive Group of Carbon Monoxide Bands" to the faculty of Johns Hopkins University in 1932. Mauchly eventually accepted a teaching position in physics at Ursinus College, a small, liberal arts college located in the outskirts of Philadelphia, where he taught introductory physics courses. However, the circumstances at Ursinus did not suit the research interests to which he had been so thoroughly conditioned. Physics itself was changing, and by the 1930s the leading laboratories in the country were equipped with accelerators, spectrometers, and other instruments beyond the resources of many state universities, let alone an individual professor working at a liberal arts college. Mauchly made some attempts to develop analog electronic instruments suitable for specific lines of research. He also discovered a wealth of meteorological data, which by the 1930s were being collected from field stations located all around the globe. Such data were available in tabular form and were transportable to an isolated researcher. Their analysis, however, required extensive calculations. Mauchly actually sought more generally to improve calculating instruments, thinking as much about the needs of his students as his own research. This preoccupation with making calculations quicker and easier led Mauchly towards calculating machines. He purchased a second-hand Marchant calculator to carry out the calculation of molecular energy levels that could be extracted from meteorological data. 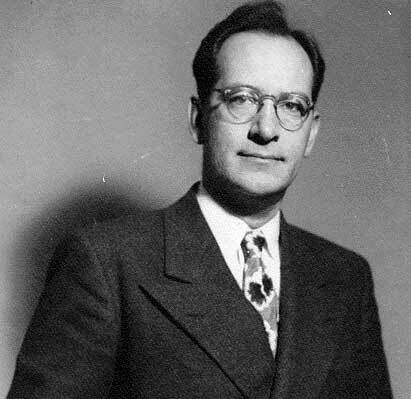 For the summer of 1936, Mauchly decided to take up a position as temporary assistant physicist and computer at the Carnegie Institution’s Department of Terrestrial Magnetism. He accepted a position as a glorified human computer, in working for his father’s former supervisor. At the end of the third summer, Mauchly submitted his work for publication in the Journal of Terrestrial Magnetism and Atmospheric Electricity. This article however, was rejected, as one of the reasons for the rejection was relying on too short a period of data analysis. Thus Mauchly start thinking about finding a means of performing a greater volume of computation. He first turned to the resources offered by the National Youth Administration, a Depression era agency that allowed him to hire students to work as human computers. Simultaneously, Mauchly turned to mechanical solutions. One aspect of this was Mauchly’s decision to examine tabulating machines, a machine that was used to routinely compute statistics in the social sciences. This new interest and his encounter with John Atanasoff eventually in 1941 led Mauchly to the Moore School of Electrical Engineering, part of the University of Pennsylvania. The Moore School stood at the heart of a strong regional electrical industry that had grown with the popularity of radio, telephony, and other electronic technologies. With the prospects of war looming, the military began to seek young engineers trained to operate the electronic weapons and communications systems that were becoming an increasing part of U.S. armaments. The Moore School stepped forward to accept a contract from the U.S. Army to teach a special ten-week course on Electrical Engineering for Defense Industries directed to students with a degree in mathematics or physics. Thus Mauchly agreed to study electrical engineering at the Moore School, despite of the fact, that he had an opportunity to take up a defense training job at another college for big money and badly needed these money. It was there he met Eckert and they began their famous collaboration. The Moore School had already developed one of the most advanced electro-mechanical computational devices in the world, the differential analyzer. The differential analyzer was a mechanical analog computer designed to solve differential equations by integration, using wheel-and-disc mechanisms to perform the integration. At the beginning of the war, the United States Army had awarded the school a contract to compute the tables of trajectories for artillery shells. Both Mauchly and Eckert became deeply involved in this project. 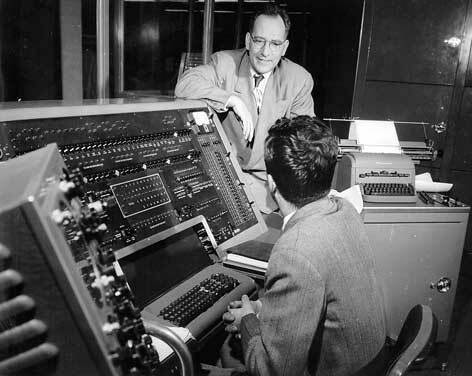 This project increased Mauchly's interests in electronic computation and step by step led him to the creation of ENIAC. In 1947 Mauchly and Eckert resigned from the Moore Engineering School and begun their own corporation, the Eckert and Mauchly Computer Corporation. Later on they developed the computers BINAC and UNIVAC. Eckert took care of the engineering functions, and Mauchly ran the business. Neither Mauchly nor Eckert, however, was a good businessman. Mauchly was very easy going and jovial man, but he was also rather unconventional. When he and Eckert visited IBM and its famous president, Thomas Watson, Sr., Mauchly flopped down on the couch and put his feet up on the coffee table. Eckert and Mauchly eventually ran into financial troubles, and in 1950 they sold their company along with their computer patents to Remington Rand. Sperry Rand later bought out Remington. Mauchly worked for Remington and Sperry until 1959, when he left to form his own consulting corporation, Mauchly Associates. In 1968, he founded a second computer consulting corporation, which he called Dynatrend. Mauchly was a dashing person with brown hair and hazel eyes. Standing about six feet and weighing 180 pounds, the long-limbed Mauchly was well read, soft-spoken, and whimsical man. He had married to Mary Augusta Walzl, a mathematician, in 1930. They had a son, James, born 1935, and a daughter, Sidney, born 1939. Unfortunately in September, 1946, while they were swimming in the Atlantic, Mary was swept out to sea and drowned. On February 7, 1948, Mauchly married to Kathleen R. McNulty, who had been one of the programmers on the ENIAC. He had five more children with her, four daughters and a son. Mauchly suffered all his life from a hereditary genetic disease called hemorrhagic telangiectasia, which caused anemia, bloody noses and internal bleeding, among other symptoms. In his later life he had to carry around oxygen to breathe properly. Despite his family, business and court problems, Mauchly had a successful career. Whatever the various turns in his life, he designed and oversaw the development of the first large-scale general purpose electronic computer. He created a start-up venture which he eventually sold at a profit to the company that went on to manufacture his computer. His work as a consultant was also successful. Moreover, Mauchly received academic recognition for his contributions: the Potts Medal of the Franklin Institute in 1949, the John Scott Award in 1961 and the Harry Goode Medal of the American Federation of Information Processing Societies in 1966. Mauchly retired to the quiet suburb of Ambler, Pennsylvania, just outside of Philadelphia. He died on January 8, 1980, of complications from an infection.